The time has finally arrived! 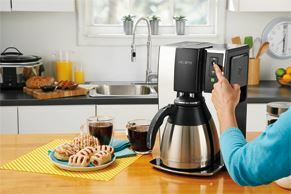 Now your "Good Morning" button can not only start playing music, disarm the alarm system, turn on the lights, and warm up your house, but not it can also start making your coffee with the Mr. Coffee® 10-Cup Smart Optimal Brew™ Coffeemaker. 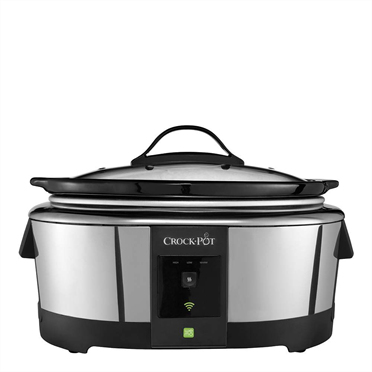 Providing even more value, our driver not only works with the Mr. Coffee maker, but it also supports the Crock-Pot® Smart Slow Cooker with WeMo. 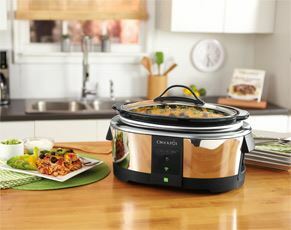 No more having to come home early to start the crock pot! Direct device integration - no going to the cloud so response time is fast. Easy device identification, simply click on the Discover Devices button and find the device you want to control in the Lua Output field. Real-time state of the coffee maker and crock pot. Integrated Watchdog variable so you can program an email or audio announcement if the device falls offline. Both drivers generate a readable report that you can input into a push notification or email that shows the wellness of the device. That includes a report of most variable, the current mode, status, and more! As with all our Control4 drivers, these come with a FREE 48 hour trial, simply download and add to your project without a license key. This driver is used to control a single Mr. Coffee Smart Coffee Maker or Crock-Pot Smart Slow Cooker. Setup and configure the Coffee Maker or Crock-Pot Smart Slow Cooker using the WeMo phone application. Add the Smart Coffee Maker or Crock-Pot Smart Slow Cooker driver to your project. If using the Coffee Maker add a Relay to the project. If using the Coffee Maker bind the Relay to the Smart Coffee Maker driver. Press the "Discover Devices" action button, and select the IP Address of the Smart Coffemaker you wish to control from the Lua Output Window. Copy the IP Address into the IP Address property of the Smart Coffee Maker driver. Enter the License Key provided when purchasing this driver. Displays the activation status of your licensing of this driver. Displays the current status of the driver. 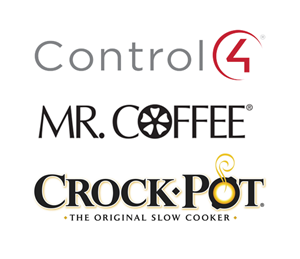 Enter the IP Address of the Mr. Coffee Smart Coffee Maker or Crock-Pot Smart Slow Cooker you wish to control. 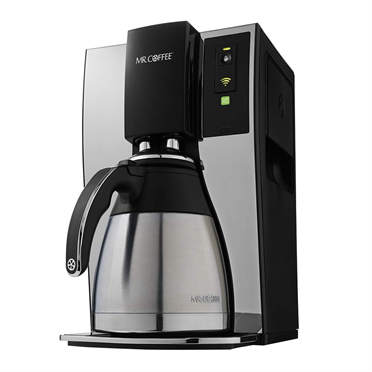 Use the "Discover Devices" action to discover the Smart Coffee Makers on the network. Automatically generates a port for the driver to receive event notifications on. Can be set manually. Displays the MAC Address of the controlled Smart Coffee Maker or Crock-Pot Smart Slow Cooker. Displays the Serial Number of the controlled Smart Coffee Maker or Crock-Pot Smart Slow Cooker. Displays the state (ONLINE/OFFLINE) of the controlled Smart Coffee Maker or Crock-Pot Smart Slow Cooker. Displays the current mode that the controlled Smart Coffee Maker or Crock-Pot Smart Slow Cooker is in. If ON, the driver will display debug messages in the Lua Output Window. 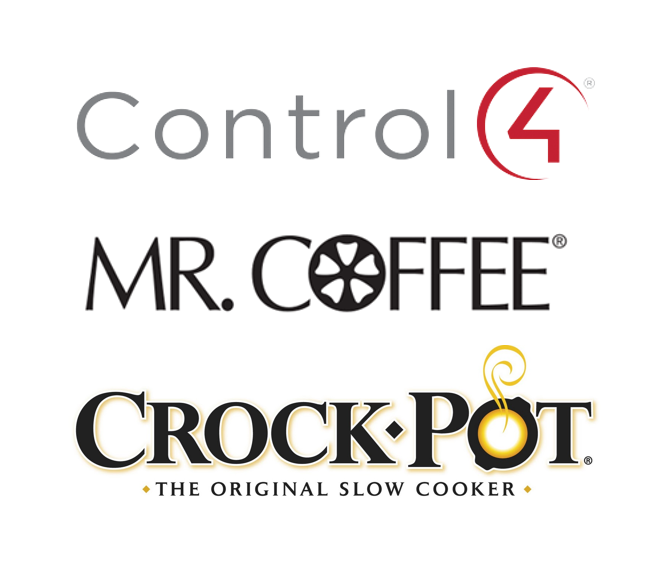 Discovers and displays any Mr. Coffee Smart Coffee Makers or Crock-Pot Smart Slow Cookers that are connected to the same network as the Control4 Controller. Allows you to send a "Brew" command to the Smart Coffee Maker. You can specify a delay and delay units. Select a delay of 0 with any units to brew immediately. This variable is set to true if the driver can not communication with the controlled Smart Coffee Maker. This variable is set to the current mode (0 through 5) of the controlled Smart Coffee Maker. - 0 = "Not Ready: Refill Water and Replace Carafe"
- 1 = "Not Ready: Replace Carafe"
- 2 = "Not Ready: Refill Water"
This variable is set to the current amount of time, in minutes, that the Coffee Maker has been in the current mode. This variable is set to true when the Coffee Maker is out of water, and false when the Coffee Maker has water. This variable is set to the last time the Coffee Maker completed brewing coffee. This variable is set to the last time the Coffee Maker was cleaned. This variable is set to true if the Coffee Maker advises cleaning itself. This variable is set to true if the Coffee Maker advises replacing the filter. The coffee maker does not require cleaning. The filter does not require cleaning or replacement. This variable is set to the current amount of time, in minutes, that the Crock-Pot has left remaining in the current mode. This variable is set to the current amount of time, in minutes, that the Crock-Pot has been cooking.